This mosaic can be seen at a Jewish synagogue in Chicago. The building is in great disrepair and the mosaic is one of the only parts of the interior that is still beautiful. When you walk in the building, the paint is peeling, the plaster is torn off, pigeons have pooped all over the benches and floors. It was built in the 1920s and it was an extravagant structure. Over time, the building owners could not maintain the building, and eventually the pigeons took over. Anyway, this image in the mosaic is a pair of hands. It reminded us of Dr. Spock, who made the same gesture with his hands on the old tv show, Star Trek. 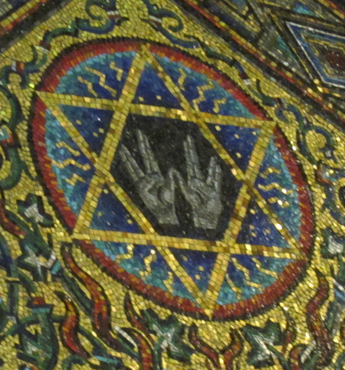 We asked the Rabbi what the hand gesture meant. He said that it was the position of the hands when someone would bless others. We wonder if Dr. Spock knew that….